In the late 1920s, the Lycoming Manufacturing Corporation of Williamsport (Lycoming County), Pennsylvania entered the aircraft engine business. At the time, Lycoming was a major supplier of automobile engines to a variety of different manufacturers. 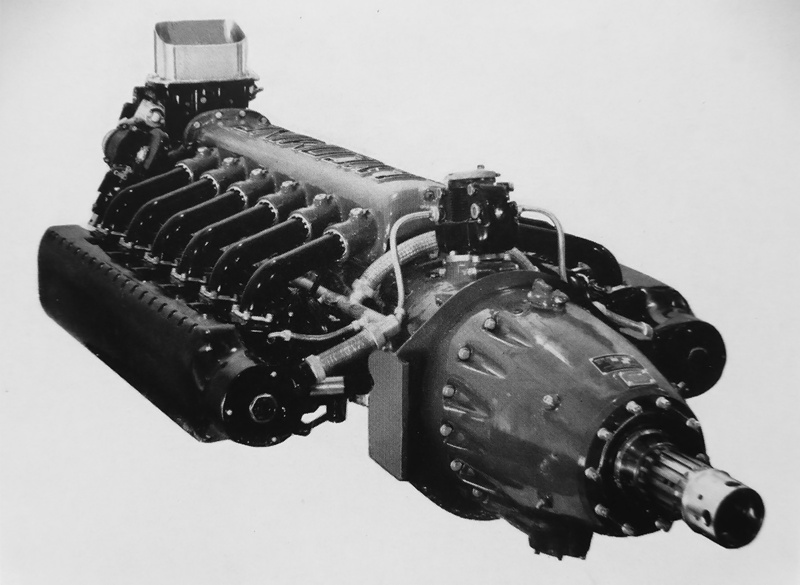 Lycoming quickly found success with a reliable nine-cylinder radial of 215 hp (160 kW), the R-680. However, the company wanted to expand into the high-power aircraft engine field. When built, the Lycoming O-1230 was twice as large as and three times more powerful than any other aircraft engine the company had built. Lycoming essentially achieved the hyper engine goals originally set for the O-1230, but other engine developments had made the engine obsolete by the time it would have entered production. In 1932, Lycoming became aware of the Army Air Corps’ (AAC) program to develop a high-performance (hyper) engine that would produce one horsepower per cubic inch displacement and one horsepower per pound of weight. The AAC had contracted Continental Motors in 1932 to work with the Power Plant Branch at Wright Field, Ohio on developing a hyper engine. The engine type was set by the AAC as a 1,200 hp (895 kW), flat, liquid-cooled, 12-cylinder engine that utilized individual-cylinder construction. The flat, or horizontally-opposed, engine configuration was selected to enable the engine’s installation buried in an aircraft’s wings. Lycoming saw an opportunity to quickly establish itself as a high-power aircraft engine manufacturer by creating an engine that would satisfy the AAC’s hyper engine requirements. On its own initiative, Lycoming began development of its own hyper engine. The AAC encouraged Lycoming’s involvement and provided developmental support, but the AAC did not initially provide financial support. Lycoming started serious developmental work on the new engine in 1933. Various single-cylinder test engines were built and tested in 1934. In 1935, the AAC became more interested in the engine and began supporting Lycoming’s efforts. Single-cylinder testing yielded positive results, with the engine passing a 50-hour test in May 1936. That same year, the AAC contracted Lycoming to build a complete engine. Lycoming had spent $500,000 of its own money and had finalized the design of its engine, which was designated O-1230 (also as XO-1230). Construction of the first O-1230 was completed in 1937, and the engine was ready for endurance testing in December of that year. Intended for installation buried in an aircraft’s wing, the O-1230’s height was kept to a minimum. The long nose case would aid in streamlined wing installations. Note that the supercharger’s diameter was slightly in excess of the engine’s height. The Lycoming O-1230 hyper engine had a two-piece aluminum crankcase that was split vertically. Six individual cylinders attached to each side of the crankcase. The cylinders were made of steel and were surrounded by a steel water jacket. Each cylinder had a hemispherical combustion chamber with one intake and one sodium-cooled exhaust valve. A cam box mounted to the top of each cylinder bank, and each cam box contained a single camshaft that was shaft-driven from the front of the engine. A downdraft carburetor fed fuel into the single-speed, single-stage supercharger mounted at the rear of the engine. Lycoming had experimented with direct fuel injection on test cylinders, but it is unlikely that any O-1230 ever used fuel injection. The supercharger’s 10 in (254 mm) diameter impeller was driven at 6.55 times crankshaft speed. It provided air to the intake manifold that sat atop the engine. Individual runners provided air to each cylinder from the intake manifold. Exhaust was expelled out the lower side of the cylinders and collected in a common manifold for each cylinder bank. An extended nose case housed the .40 propeller gear reduction, with options for a .50 or .333 reduction. On the top of the O-1230, just behind the gear reduction, was the engine’s sole magneto. The magneto was connected to two distributors, each driven from the front of the camshaft drive. 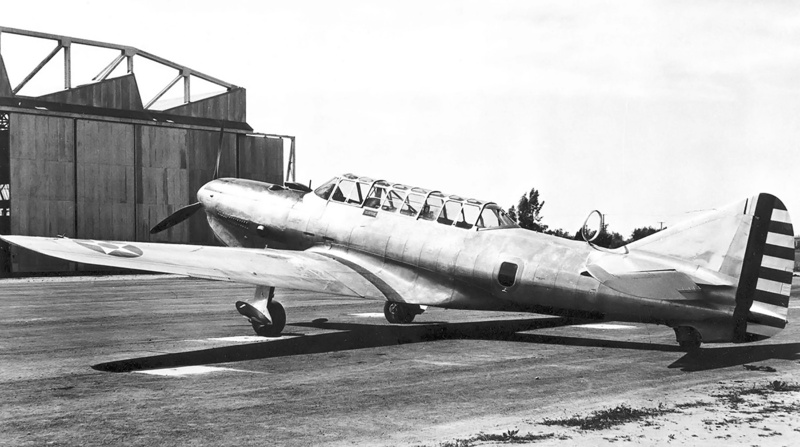 The O-1230-powered Vultee XA-19A before it arrived at Wright Field. The scoop above the cowling brought air into the engine’s carburetor. Louvered panels allowed heat generated by the exhaust manifold to escape the cowling. The O-1230 had a 5.25 in (133 mm) bore and a 4.75 in (121 mm) stroke. The engine’s total displacement was 1,234 cu in (20.2 L), and it had a 6.5 to 1 compression ratio. The O-1230 produced 1,200 hp (895 kW) at 3,400 rpm for takeoff, 1,000 hp (746 kW) at 3,100 rpm for normal operation, and 700 hp (522 kW) at 2,650 rpm for cruise operation. The engine had an overspeed limit of 3,720 rpm for diving operations. The O-1230 was 106.7 in (2.71 m) long, 44.1 in (1.12 m) wide, and 37.9 in (.96 m) tall. The engine weighed 1,325 lb (601 kg). After completing a type test in March 1939, the O-1230 was rated at 1,000 hp (746 kW). Continued development pushed the engine’s rating up to 1,200 hp (895 kW). The O-1230 was installed in a Vultee YA-19 attack aircraft that had been modified as an engine testbed and redesignated XA-19A (38-555). 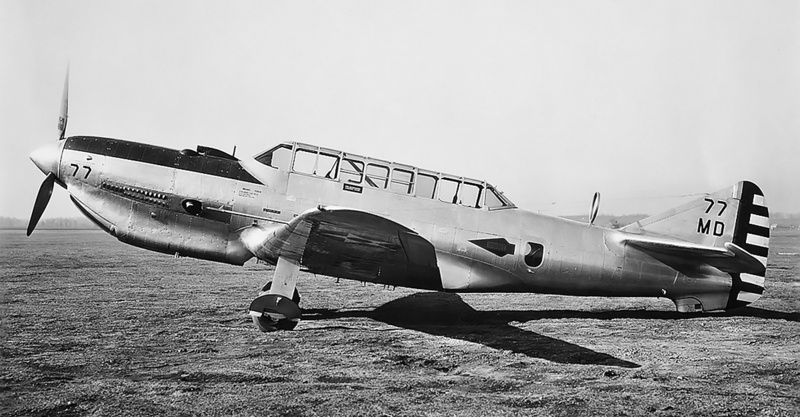 Some sources list the designation as YA-19A, but “Y” was typically used for pre-production aircraft, while “X” was for experimental aircraft. The O-1230-powered XA-19A first flew on 22 May 1940, the flight originating at Vultee Field in Downey, California. The aircraft and engine combination were transferred to Wright Field, Ohio in June 1940 and then to Lycoming on 27 March 1941. By this time, the AAC had already moved away from the buried-engine-installation concept and was interested in more powerful engines. The XA-19A is seen with its Wright Field markings. The aircraft’s tail was modified to compensate for the larger and longer nose needed to house the O-1230. The radiator positioned under the engine added bulk to the O-1230’s installation. Note the large exhaust outlet. While the O-1230’s power output was on par with many of its contemporaries, such as the Allison V-1710, the O-1230 did not offer the same development potential or reliability as other engines. The O-1230 was cancelled in favor of other projects, and the engine was subsequently removed from the XA-19A airframe. The XA-19A was transferred to Pratt & Whitney on 8 August 1941, where an R-1830 was subsequently installed, and the aircraft was redesignated XA-19C. Lycoming was still interested in developing a high-power engine and used O-1230 components to create the 24-cylinder XH-2470. In some regards, the Lycoming XH-2470 was two O-1230 engines mounted to a common crankcase. Lycoming started initial design work on the engine as early as 1938. A single O-1230 survived and is on display at the New England Air Museum in Windsor Locks, Connecticut. This entry was posted in Aircraft Engines, Between the Wars on 20 April 2018 by William Pearce.